Looking for the perfect adventure for your youth group or Christian school? 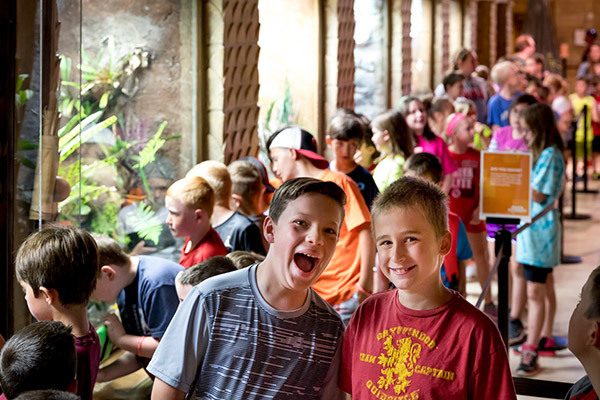 Try a sleepover at the Creation Museum! Take a flashlight tour of the exhibits—and watch out for dinosaurs! 2019 programs are booking now. Request your reservation soon. Overnights are available Sunday through Friday evenings, January to November. Bookings must be at least two months in advance. 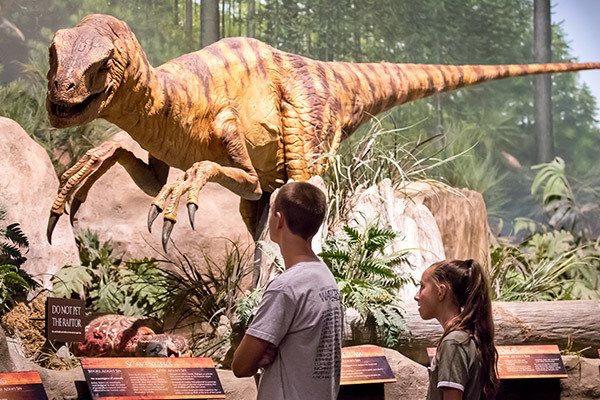 After closing for the day and turning the lights down low, the Creation Museum’s hundreds of exhibits are yours to explore at your own pace—from the Garden of Eden to the Dinosaur Den. Head off on a scavenger hunt, then settle in for some entertaining and educational videos, and grab a bedtime snack before lights-out at midnight. Roll out your mats and sleeping bags in the darkened halls, and settle in for the night. Girls and boys sleep separately in different exhibit areas. Check-in for overnight visit. Bring in bedding. After breakfast in Noah’s Café, pick your favorite seats for a private showing in the high-tech Stargazer’s Planetarium. Afterward, you’re free to tour the museum during regular operating hours on day two. Minimum of 30 participants (or paying for 30) required, maximum of 70. This program is intended for youth and school groups ages 9 to 17, not groups of adults. Don’t miss getting your group picture taken by FotoFX! Special overnight package rate of $16 includes one print and a digital copy. Extra prints are $6 each. Prices include 6% Kentucky sales tax. Minimum group size is 34. Maximum group size is 78. An evening snack and breakfast are included in the price of the overnight experience. If you should have additional meal needs, let us assist you with the details. Book your next overnight adventure at the Creation Museum’s sister attraction, the Ark Encounter.